The Okanagan Valley is an important place for birds with over 200 species nesting and raising their young here, and many others migrating through to and from their breeding grounds. 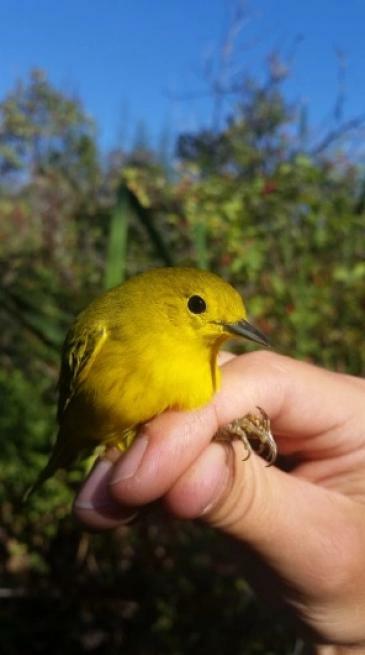 The Bird Migration Program offers Grade 3 and 4 classes an excellent opportunity to learn about bird migration, adaptation and survival, the conservation issues they face, and the importance of bird banding. The two-hour program has strong links to the new science curriculum. Vaseux Lake Bird Observatory is managed by OSCA and is one of nine bird migration monitoring stations in BC. The station is located 1 km north of Vaseux Lake between Hwy 97 and the Okanagan River where migrating birds funnel through a narrow section of the valley. Station staff work with environmental educators and volunteers to offer this exciting outdoor program. PLEASE NOTE: This site is not wheelchair accessible. Recommended start time: Mornings only with students arriving at site by 9:30 a.m. or earlier. Transportation: bus transportation is provided free of charge. Buses will depart at start of school day and will return to schools before lunch. To register: email Jayme Friedt at oscaecostudies@gmail.com. Only 10 sessions are available, so book early. Okanagan Similkameen Conservation Alliance (OSCA) presents its fourth annual Bird Migration Day open house at the Vaseux Lake Bird Observatory (VLBO) on Saturday September 23, 2018 from 9 am to noon. The event offers visitors a chance to see birds being banded, go on a guided walk with nature interpreters and learn about birds and bird migration. The Bird Migration Day focuses on three themes: bird adaptation to migration, bird conservation issues and threats, and bird banding. Location and information Vaseux Lake Bird Observatory, located 3 km south of Okanagan Falls. The site is rustic with uneven terrain and narrow pathways (not wheelchair accessible). There is a portable washroom on site. Parking is available on the west side of Hwy 97 at a roadside pull-out just north of the site. Watch for signage and volunteers to direct you to the parking area. The event runs rain or shine. For more information contact Jayme Friedt at 250-488-9894 or oscaecostudies@gmail.com.